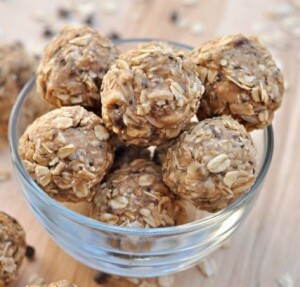 These little balls of energy are great for a quick breakfast or for on the go. For the healthiest snack, use peanut butter with no added sugar or oils (often labeled as “natural” peanut butter). Mix all ingredients together in a large bowl. Refrigerate for 20 minutes so mixture will stick together better (optional). Roll the mixture into 1-inch balls, or whatever size you’d like. Eat immediately or refrigerate for later.